The link between bad behaviour, language and communication. As a parent I know that there have been many times when I have responded to ‘fix’ behaviour rather than find out what is behind the behaviour and help my children through whatever it is that is causing them problems. The organisers of the SEN Jigsaw Conference is thrilled to have long time supporter and past workshop leader, Libby Hill join us again this year as one of our plenary speakers. Libby is a UK wide respected speech and language therapist and has extensive experience of working with children and helping them to develop. Libby, please could you tell our readers a little about yourself? I’m a parent of 2 sons, both have dyslexia and one has APD. I have been a SLT for well over 30 years now both NHS and independent for the past 10 years. I am highly specialised in Autism Spectrum Disorders and complex communication difficulties. The following video shows Libby in action as a speech and language therapist. I see children from allover the UK with more complex difficulties inc ASD, PDA, Selective Mutism and APD. I use animal assisted therapy as part of my work. I am very aware that if a child has speech, language and/or communication difficulties it has a huge negative impact on almost every aspect of their life. I love problem-solving so enjoy nothing more than working out the issues and then designing a solution. It means I have to be constantly learning more and being increasingly creative! Working with parents as an integral part of the team is essential, so I do lots of parent and professional training. I want to make a difference. 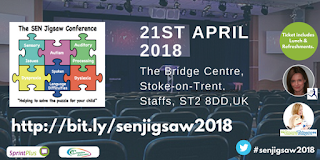 Please tell us about your plenary talk at the SEN Jigsaw? Book your place today. Click here. see so many children with behaviour issues who have underlying communication difficulties. These issues are a huge cause of the behaviour yet no-one has thought of speech and language therapy because they ‘talk fine’. What will our delegates gain from listening to your plenary? The confidence to know that all behaviour IS communication. A child’s behaviour is telling us something. We need to look at the causes not reach straight for the consequences. Children who need the most help ask for it in the least helpful ways! How can our readers find out more about you? For more information about me and my work then your readers are invited to take a look at my website which can be found by clicking here , or they could simply come to the SEN Jigsaw Conference and attend my plenary talk. Click here to book your ticket.